Noor Azizan Rahman Paiman is one of Malaysia’s top 10 contemporary artist. 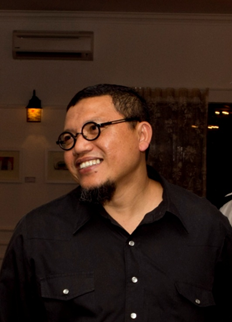 Azizan Paiman was born in 1970 in Melaka (Malaysia). He lives and works in Seri Manjung in Perak, Malaysia. He received a MA in Fine Art from Manchester Metropolitan University, UK, in 2001 and a BA in Fine Art from University Technology MARA UiTM, Malaysia, in 1995. He presented “Putar Alam Cafe”, where he created a cafe inspired by the design of The Pentagon. He invites audience to have a cup of coffee to discuss and debate various contemporary issues. In Malay, “Putar Alam” refers to charlatan, a person fond of cheating, deceiving, tricking and swindling other people for his or her own selfish benefit. He presented his series “The code”, portraying politicians and others speaking in typed exchanges quoted from newspapers, magazines and other media sources in Bahasa Malaysia and English. The works revealed both the humor of everyday life and the fragility of its participants. These commentaries also referenced mythical beings in Southeast Asian life, showing that Malaysia’s socio-political history could be seen as a repetition of earlier stories. He presented “Ais Krim Malaysia”, created a Malaysian flavored ice-cream (sweet & spicy), while pushing his ice-cream cart, he gives out his Ais Krim Malaysia to curious passer-by in Fukouka, Japan, sharing with them the taste of Malaysia. Azizan Paiman has participated in numerous solo and group shows in Malaysia and abroad (Singapore, Japan, New York, Australia). His practice has been the object of a quantity of articles in the media since 1994. His artwork plays with social mores, politics, gender issues and current events with a focus on Malaysian contemporary life. His artworks are inspired by the rapid, intense changes that Malaysia has gone through as a nation over the years. He calls himself ‘a back-dated reporter’. He transmits his thoughts, feelings, opinions on people and things around him, and put down his layman analysis on canvas. His works are also part of the major private collection in Malaysia, while some are in South-East Asia, France and USA. Click here to view Noor Azizan Rahman Paiman’s artworks.